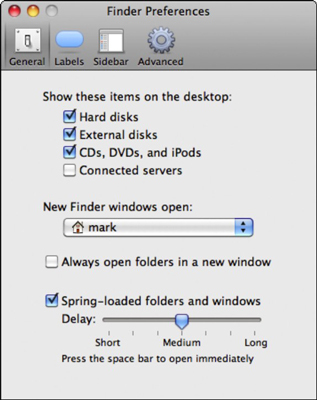 You can change a number of Snow Leopard’s Finder settings for things like what and where to search and how the Finder window opens. To change these settings, from the Finder menu, click Finder and choose the Preferences menu item to display the Finder Preferences dialog. You can configure your Finder preferences here. Displaying Icons on the Desktop: Select these check boxes to display your hard disks, removable volumes (including CDs, DVDs, and iPods), and connected network servers. New Finder Windows Open: Click the pop-up menu to specify where a new Finder window should open. By default, a new window displays the contents of your Home folder. Spring-Loaded Folders and Windows: If this check box is selected, you can drag an item on top of a folder without releasing the mouse button and after a preset time (controlled by the Delay slider), a spring-loaded window appears and show you the folder’s contents. At that point, you can release the mouse button to drop the file inside the folder, or drag the icon on top of another subfolder to spring it forth and drill even deeper. The Labels preference pane is a simple one; just click next to each label color to type your own text for that label. From the Sidebar preferences pane, you can choose which default items should appear in the Finder window Sidebar column. Show All File Extensions: If this check box is selected, the Finder displays the file extensions at the end of filenames. Show Warning before Changing an Extension: Also on by default, this setting forces Snow Leopard to display a confirmation dialog before allowing you to change the extension on a filename. Show Warning before Emptying the Trash: By default, this check box is selected, and Mac OS X displays a confirmation dialog before allowing you to empty the trash. Empty Trash Securely: If you’d prefer to use the more secure method of emptying your Trash — where deleted items are far harder for anyone to recover — select this check box. When Performing a Search: Click this pop-up menu to specify whether the text you enter in the Finder window Search box should match everything on your Mac or whether the search should be limited to the current folder only. Choose Use the Previous Search Scope to use the scope setting you used during your last search. After you make the desired changes to the Finder Preferences, click the Close button to save your settings and return to the Finder.